The power, beauty, and serenity of the Pacific Northwest make it the perfect locale for musical dreams and inspirations to take shape and thrive, an environment few natives would ever care to leave. Yet, after nine very popular, self-produced, contemporary jazz albums, Portland, Oregon born-and-raised keyboardist Tom Grant felt it was time to try something outside the cool and calm realm. He decided to enter a New York state of vibe, and with the help of Omar Hakim, George Howard, Kirk Whalum, and bassist/producer Wayne Brathwaite, emerged with the eclectic and soulful release called In My Wildest Dreams (Verve Forecast). The idea to expand his studio horizons was mutually decided between Grant and the powers that be at Verve Forecast, and he is more than tickled with the results. "I used to live and work strictly at home, suing my local musician buddies, being a control freak," he explains. "But when the label made the suggestion, I thought it was the right time. We both decided on Wayne (who had produced Kenny G and Najeel) and from the beginning, I trusted him completely. "For the first time, I was shaping tunes with an outside person giving input, and I learned a lot of new aspects of composition and production. What Wayne and Omar did in the rhythm section gave my music a completely new identity." 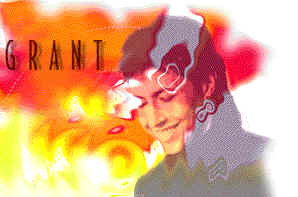 Although the album, like many of Grant's previous successes [i.e. last year's Edge of the World, which made the Billboard Top 10], promotes generally positive feelings, a developing tragedy made it the most difficult album of his career: midway through the proceedings, Brathwaite developed cancer and has since passed away. "It put a strain on all of us involved, but I felt it would have been wrong to stop in the middle," Grant recounts. "The main thing I'm pleased about is that Wayne helped me realize I can cut it working with the big cats, and I'm looking forward to doing that in the future, maybe next time in L.A."
Besides Grant's breezy trademark acoustic piano finesse, the other aspect of In My Wildest Dreams which will stimulate ears everywhere is his vocal contributions. With the exception of the closing acoustic ballad, "Heidi's Song," the keyboardist's easygoing vocals are present everywhereÑbehind Sharon Bryant's lead on "I've Just Begun to Love You," harmonizing with his melodic piano, and even backing his own torchy lyrics on the title cut. While he's the first to admit he's no Sinatra or Manhattan Transfer, voice is an important part of the way he constructs melodies and, therefore, and integral color in his musical palette. "Make no mistake, I have no illusions of being a great singer," he realizes, "but when I write with my voice, along with the right hand melody notes on the piano, it helps make a tune more memorable. It's like people said about Miles, he could sing, but he 'sang' with his horn. I've been doing wordless vocals since my first album [a European release in 1976], before I'd ever even heard George Benson do it." Grant also recalls several private piano instructors he had between the ages of five through seventeen telling him to "make those notes sing." His parents were vaudeville performers, and he remembers his father teaching him to play by ear at age four. But while he grew up listening to Miles, Coltrane, and Monk, and performed in jazz bands in high school, mom and dad knew the rigors of who biz and discouraged their son from pursuing a career in music. While majoring in, of all things, political science at the University of Oregon, ("I thought I'd become a lawyer or something like that"), he played in dance bands on weekends and continued to play the after hours circuit in Portland after becoming a high school teacher in his early 20s. It was while Grant was a sideman with saxophonist Jim Pepper's local band, playing everything from "jazz to rock covers to Indian chants," that trumpeter Woody Shaw came by one night, sat in, and immediately hired the ensemble to tour Canada with him. "Friends had encouraged me to take music more seriously, but this was pure luck," Grant says. Luck turned to hard but enjoyable work as one gig led to another and the ex-schoolteacher found himself touring the States and Europe with Joe Henderson, Charles Lloyd, and Tony Williams. While he had established himself as a valuable straight ahead pianist, playing the more funk-edged material with Williams prompted Grant to take a lighter approach when he decided to make the break as a solo artist in 1980. "People wonder why I didn't want to record real jazz albums," he explains, "and the reason is that I got sick of playing just jazz and more jazz all night long. Jazz was where my heart was, but I wanted to become part of a new eclecticism, where I could also incorporate my love for rock 'n roll. I was a child of the '60s, and was big into the Beatles and Stones, too. It was important to me to cop a little of those vibes as well." Another important factor in his decision to integrate pop and jazz was the idea that, "In the '40s, jazz was dance music, but it's not anymore. I wanted some backbeat once in a while." His first "real" album was in 1980, but was disappointed that a project featuring Patrice Rushen, Tony Williams, and Jeff Lorber could be so "poorly produced, a real mess." After that experience Grant regrouped, formed a band in 1981 with guitarist Dan Balmer (who plays on the new album), and began shopping a deal. Quite by accident, Pausa Records heard a tape, and a self-titled label debut followed in 1983. Eventually, with new management and improved product a few years later, Grant's career as a pop instrumentalist exploded. Despite the numerous struggles, he's glad he got into the genre when he did. "It was hard for a while, but a few folks were willing to take a chance on a newcomer back then. There were so few of us," he recalls. "Nowadays, there's so much competition in the instrumental market, it's harder to get signed and find a good niche. I'm pretty content where I am. Years ago, if you'd said I'd be a working musician, let alone a successful artist, I would've thought, 'Right, in my wildest dreams.'"